I already posted a photo of the books I acquired last week, but here I discuss them in more detail. Nearly half of these are rescue books, i.e. 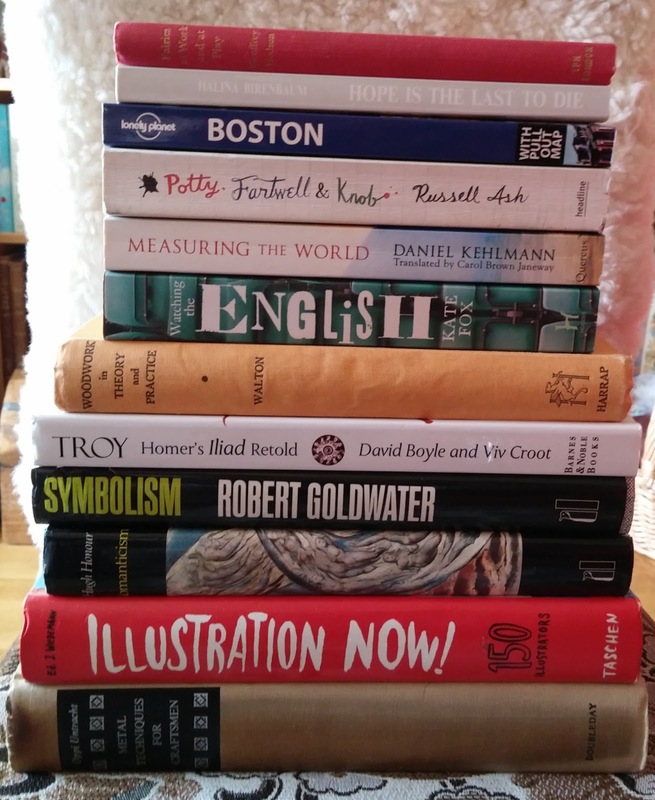 books gleaned from the freebie bin at one of the charity shops I regularly visit. From the bottom they are no. 1, 2, 3, 6 and 12. The rest I got second-hand from two other charity shops. Fairies at Work and Play by Geoffrey Hodson. I thought I was picking up a book of fairy tales, but this turned out to be something more remarkable: Descriptions of beings, classed for convenience under the heading of "fairies", observed by the author and published by the Theosophical Publishing House. Wikipedia reveals that the author was a Theosophist who wrote extensively about Theosophy and clairvoyance. Depending on whether you believe in fairies or not, this is either a natural history of fairies and other nature spirits, or a marvellous fantasy. Hope Is the Last to Die: A Coming of Age Under Nazi Terror by Halina Birenbaum. I have had Night by Elie Wiesel on my TBR list for some time and I though it would be interesting to read these books one after the other to compare female and male experiences of the Holocaust. The Lonely Planet Boston guide is the latest addition to my growing collection of guide books. As a general rule, I prefer Eyewitness guides, but I'll buy LP, Rough Guides, Let's Go or other guidebooks if they interest me. I have been thinking about taking a trip by myself to the US for some time, and had decided I would either visit New York or Boston, as they are both quite easy to get around in by public transport. The book is 9 years old, but will give me a general idea of things to see and do. Potty, Fartwell and Knob: From Luke Warm to Minty Badger - Extraordinary But True Names of British People by Russell Ash. This is one of those books that proves you can publish a book about just about anything. I happen to live in a country where there are laws governing what names people can give to their children, but even so, there have been some fairly strange names in use in Icelandic. I'll probably keep it in the loo and read a few pages at a time, as it's mostly composed of lists. Measuring the World by Daniel Kehlman. A historical novel about two real-life gentlemen obsessed with measuring the world: Alexander von Humboldt and Carl Gauss. It remains to be seen if it arouses my sense of wrongness about using real-life people in novels, but I don't think so, as both of these men are merely names for me. Here's a review that gives a bit of insight into the story. Watching the English: The Hidden Rules of English behaviour by Kate Fox. This promises to be an interesting bit of sociology/anthropology. Woodwork in Theory and Practice by John Arthur Walton. I have asked my father to teach me how to use his lathe to work wood, and this looks like a nice introduction to the subject, plus it covers other kinds of woodwork as well. Troy: Homer's Iliad Retold by David Boyle and Viv Croot, edited by Michael J. Anderson. Some of the reviewers on Amazon liken this to an extended Cliff's Notes on the Iliad, which makes it quite a useful book to have. Now I just have to decide which translation of the Iliad to read. Symbolism and Romanticism are two volumes from a collection of books about various art movements and the theories behind them. I rescued them in the hope that there is some discussion of the literary side of these theories. Illustration Now! is a gorgeous coffee-table book devoted to imagery by 150 illustrators, and not a whole lot of text. I look forward to looking through it and maybe finding inspiration for my own art. The publisher, Taschen, specialises in art books of all kinds and they are always beautifully designed. Metal Techniques for Craftsmen: A Basic Manual for Craftsmen on the Methods of Forming and Decorating Metals by Oppi Untracht. I rescued it thinking my father might find it useful, but really would like to keep it for myself because of the illustrations.